Learning Leads to Varying Degrees of Understanding, Part I – Erik Kondo – Conflict Research Group, Intl. Conceptualization is the mode where you are consciously thinking about what you are trying to understand. This is typically exemplified by listening, reading, watching, thinking, and visualization type activities. This could be the beginning stage, but it could also be a deeper refinement of something you already “know”. This mode is commonly thought of as cognitive learning. Learning a framework or an overall strategy is also an example of conceptualization. Training is the mode in which you have some idea of what you are trying to understand. You are engaging in activities that teach through the process of doing. This mode is typically thought of as deliberate practicing. Common examples of this mode are drills and repetition exercises. Dividing a strategy into steps and rehearsing the steps individually or in specific sequences are examples of training. For physical activities, this mode is commonly (incorrectly) thought of as “muscle memory” style learning. Experience is the mode when you are actively applying what you have learned or you are engaged an event that relates to the subject. 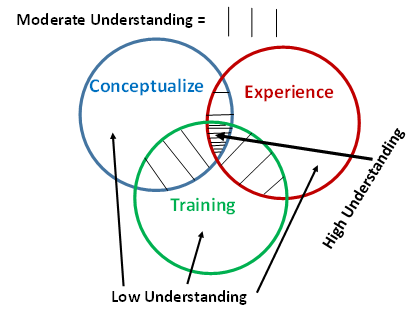 It is experiential learning where the process of the experience is the main focus of the learning. Many times, the goal of understanding is to become more effective at applying. Using or (not using) conceptualized and trained strategies and steps in an actual experience is an example of learning through application. The “school of hard knocks” is an example of this type of learning. These three modes are work together to create understanding. Each mode has a different part to play. They are all an essential part of the process of learning. This learning process applies as much to learning math as it does to learning physical self-defense. A conceptualization aspect of calculus is learning that an integral equation describes the area under the curve. Whereas, a conceptualization aspect of physical self-defense is learning the difference between the legal use of force and illegal fighting. A training aspect of arithmetic is learning by repeatedly doing and memorizing addition and subtraction. Whereas, a training aspect of physical-self-defense is learning by practicing and drilling strikes, falls, and throws. An experience example of algebra is learning by solving real life mathematical problems. Whereas, an experience example of physical self-defense is learning from the experience of being attacked. Each of these modes is important in their own right. But depending upon the subject to be understood, effective learning doesn’t necessarily require the same amount of time given to each mode. For example, a ski racer may spend thousands of hours training to race during a career, yet the total time spend actually experiencing a race may only total to be a few hours. He or she may spend a moderate amount of time thinking about his or her racing strategy, the physics of skiing, and how to best prepare for a race. A bouncer on the other hand, may have learned mostly from on the job experience with a moderate amount of training, and minimal formal education on conflict management strategies and tactics. Conversely, an academic professor of urban studies, may have devoted decades to researching about violence, and have no first-hand experience with violent incidents, and little training to deal with violent people. A martial artist could be like the skier, or may have practical experience like the bouncer, and/or may supplement his or her training with reading books and studying educational material. There are different levels of understanding. But a high level of understanding is the result of a learning process that incorporates all three modes of learning. A lower level of understanding comes from insufficient learning in one or more of the three modes. The Karate Kid may have had some practice, but he didn’t understand what he was doing. And if not for the requirements of a Hollywood ending, his actual “fighting” experience would have taught him a hard lesson. The huge doorman at your local club may have years of hard knocks experience. But he may have plateaued his ability years ago by shunning the need for further professional development. He also may not be able to teach his family and friends any useful lessons on self-defense. The “expert” interviewed on TV on the subject of inner city violence, maybe the head of criminology at a prestigious university, but may be unable to deal with an aggressive student. Problems arise when people confuse the different modes of learning or believe that one mode of learning is “better” than the other. Thinking that your favorite mode of learning is inherently better than the others is like thinking that Paper is better than Rock. Yes, Paper beats Rock, but without Rock, Scissors would always win. When someone posts a slow moving conceptual instructional video, many training oriented people will dismiss the movements as being too slow to be useful practice. When a training video is posted, many people with experience will dismiss it as being unrealistic. When someone posts a CCTV video of an actual victimization, some conceptual and training oriented people will point out why their understanding is better than that of the victim. In this case, without experience, they don’t know, what they don’t know. They don’t know what they are missing. In the above examples, all of the people are engaged in some part of the learning process. But they fail to recognize the missing aspects of high understanding. And as a result, they are unlikely to increase their level of understanding any further. The following video is an example of what happens when people use different learning modes at the same time. It is misunderstood as “play fight vs. real fight”. The difference between play fight and real fight. Learning Leads to Degrees of Understanding, Part II – Erik Kondo – Conflict Research Group, Intl.